Why can't I change who my Chatter post is going to in Lightning? In Classic, when I created a new post, I could edit the "To" section and change it to whatever group I wanted. Now, it defaults to My Followers unless I go to the actual group page and post in that feed. It is inconvenient, for Mobile users especially, to have to do all that navigation to send my post where I want it to go. Certain things, I don't want all my followers to see, so tagging the group in the post is not a suitable work around. Is there a setting I can change to enable this feature again? This doesn't work in Lightning. You can vote for my idea though! Is anyone else encountering a similar issue? I noticed that when I export a a report "formatted", my close date is changing to one day prior to what is shown on screen. When I export the same report "details only", my close date matches what is displayed on screen. I set my report date range to this year and my report displays correctly within SF. When I export the report "formatted", the dates change. Spring 19 Lightning Report [Formatted Export] Date and DateTime fields values are not consistent with the ones shown in the run page. Relationship between "Trailblazer Community" account and "Trailblazer Community Groups" account? I'm sure this is answered elsewhere, but I couldn't find the information. 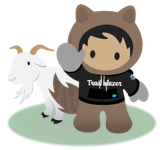 There is also the "Trailblazer Community Groups" site https://trailblazercommunitygroups.com. As far as I can recall, the only time I ever use this site is when I RSVP to attend a local user group in person. I may be mis-rememberhing, but I swear that when I've done this in the past I was able to log into https://trailblazercommunitygroups.com by using the same Salesforce instance that I use to log into the Trailblazer (Success) Community. Last week I got an invitation to a local community group that I want to attend, and they seemed to have changed the login interface for https://trailblazercommunitygroups.com. Now when I try to log in it doesn't prompt me to log into a Salesforce instance, it just asks me to fill in an email address and password directly on the page (see screenshot). Alternatively, I can use LinkedIn, Facebook, or Twitter to log in. When I enter the email address an password associated with the Salesforce instance that I use for my Trailblazer (Success) Community account, I get an error message that says "the e-mail address and/or password you specified are not correct." Separately--on Trailhead https://trailhead.salesforce.com--my account is tied to my LinkedIn credentials instead of a Salesforce instance. When I encountered the above error I tried the LinkedIn option to log into Trailblazer Community Groups"; this got me in, but it set up a brand new account from scratch instead of logging me into my existing account. Can anyone tell me what's going on here? Is there a way to log into https://trailhead.salesforce.com using a specific Salesforce instance like we do here? If so, how do I do that? This is fun, this was the #1 question at the Community Kiosk at Dreamforce last week. Soo...we used to use a platform called 'SplashThat' to manage our user group meetings, I can say amongst the User Group leader set I don't recall it winning a popularity contest. At the end July, the Success Community was rebranded and with that came the new TrailblazerCommunityGroups.com site & branding. This is entirely different from the platform where you used to sign in (SplashThat) that was connected to your success trailblazer community credentials. With this new platform, you can register with an email or social sign-on, which is great for all attendees that may not have a specific salesforce login that are interested in learning more about Salesforce, WiT groups, etc. 3) SplashThat uses to use these same credentials, but was retired in August. 4) There is a new platform, Bevy, that requires you to register with your email or social logins and all previous ones do not work. how can I exploit partner communities to manage internal project? Every partner need to use a licence? or the acces to community is free? In salesforce, every user must have a license. If you want to assign a community to a user, the user mus have a partner/cusotmer community license and a profile that has limited access on different objects. You can restrict the users on profile and permission sets and different sharing settings. Jasmine or Mocha wrapper in Lightning Testing Service does not provide actual code coverage. How to measure code coverage? Lightning testing service report does not include code coverage parameter. Where the heck is this hiding? I can see a list of my current Lightning for Outlook User Mapping but can't find where I add other users. It appears the Lightning For Outlook User Mapping will show all users that have authenticated with Lightning For Outlook. I played with LfO a bit at the end of last year and if memory serves, as long as the email address matches, the user should be able to connect as long as they can authenticate with the Outlook plugin. On my Opportunity page, the Submit for Approval button is visible for both Classic and Lightning users. For some reson, the users in classic can click the button, the std popup comes up about the record being locked, but when click OK, nothing actually happens, it stays on the opportunity page, no longer showing it is locked and submitted. For the lighting users, they cna click the button, the std popup happens, they click OK and the page refreshes showing it has been submitted and is now locked. Any thoughts as to why it is not working in classic? This issue was a reported Salesforce defect which has now been resolved. Thank you for everyone's support. How can I create a formula that sums the total number of open opportunities? I want to create a formula field to calculate the number of all open opportunities ( all opportunities except closed) to use in a report that then will have a summary formula column that uses this field opportunity. Can anyone tell me how to write this formula? Can I change the default related to in global action tasks? In the screenshot you can see it automatically recommends searchnig for a contact and account but with this action buttion it would always be related to an opportunity. Can we default it to opportunity without having to click the arrow and select it? I will definetly choose the best answer and like your page! By doing the above it will make it as a button in the object you chose. It will then auto populate that field based on the object you made it available. Anil & Mayank were also correct because there is no way to do this on the global action page layout.